Built in 1912, the Hamilton’s modern Renaissance style combines historical beauty with the vibrant, youthful energy of the neighborhood to create a wonderful ambience for its residents. The building is lovely inside and out, starting with its façade, with its 3 1/2-story rusticated limestone base and arched windows on the top floor. You enter through the double doors into a vast, elegant marble lobby with patterned stained-glass windows. A suit of armor stands at attention opposite the shining wood counter. The Hamilton’s internal halls have been beautifully restored as well, complete with their original wrought iron railings and marble steps. 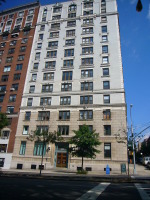 The pre-war detailing extends to the apartments, which feature beamed ceilings, French doors, hardwood floors, oversized windows, and large foyers. The turn of the century Hamilton faces Riverside Park, affording residents breathtaking views of the park and the Hudson River beyond. You’ll especially appreciate the panoramic outlook from the communal outdoor roof deck, with its groupings of tables and chairs, and planters of attractively manicured greenery. Other amenities of this impeccably maintained, pet-friendly building include a full-time doorman and concierge, a live-in superintendent, elevators, bicycle rooms, a laundry room, gym, and storage rooms. Part of the renowned Columbia University neighborhood, the vibe is energetic and fresh. The Hamilton is also very close to public transportation (the 1 train and many city buses), varied dining, and superior shopping, including a greenmarket on Broadway.